In case you haven’t heard, Taylor et al. (2009) recently argued that sauropods naturally held their cervico-dorsal junctions in extension, and their cranio-cervical joints in flexion… at least, when they weren’t foraging, feeding or engaged in other such activities [if you need help with those terms please see the Tet Zoo article here]. Given that we here at SV-POW! are predominantly interested in sauropods, and given that the amazing necks of these animals have long been such a source of debate, it stands to reason that sauropods might get used as the ‘poster children’ or exemplars for any particular argument about neck pose in fossil tetrapods. However, as we’ve said here and there – I certainly mentioned it in my Tet Zoo article on the subject – the contention (that cervico-dorsal junctions are maintained in extension, and that cranio-cervical joints are maintained in flexion) holds true for all terrestrial amniotes and, to a degree, all crown-group tetrapods. In this article we’re going to do something a little odd for SV-POW! – we’re going to look at other fossil amniotes to see if and how this affects them. Have any of them also been reconstructed in poses that are not compliant with the data from living animals? The short answer is yes, yes they have. First off, fossil mammals mostly get by ok, which is what you’d expect given that they are generally very similar to their extant relatives. Likewise, there aren’t any fossil birds that have been reconstructed incorrectly, and again you’d hope not given that they’re generally highly similar to extant forms. The extinct moa from New Zealand (that’s moa in the plural sense) are sometimes shown standing at rest with non-extended cervico-dorsal junctions, but with extremely strong extension in the anterior part of the neck that makes up for this (Worthy & Holdaway 2002). While extension at the cervico-dorsal junction may be subtle or absent in living ratites when they are feeding or foraging, in relaxed individuals extension at the neck base is indeed present. What about other dinosaurs? Here’s where we do find quite a few reconstructions that contradict our contention. For a start, basal sauropodomorphs – the animals conventionally lumped together as prosauropods – have often been shown with non-extended cervico-dorsal junctions and fully extended cranio-cervical junctions: that is, with necks that emerge in a straight line from the body, and heads that have their long axis parallel to that of the neck. Classic examples include Kermack’s reconstruction of the animal formerly known as Thecodontosaurus and Weishampel & Westphal’s Plateosaurus. There are many others. Historically, non-avian theropods have been depicted with elevated necks, flexed cranio-cervical junctions and all that. So far so good. One specific exception does come to mind however: Tarsitano (1983) produced a truly awful theropod reconstruction in which the neck was shown as straight and with a non-extended cervico-dorsal junction. The latter is a no-no, and so is straightening the neck this much, as the shapes of the centra and neural arches show that the cervical vertebrae of theropods were held elevated and in a gentle S-curve (see Molnar & Farlow 1990). A few artistic reconstructions of non-avian theropods have given them non-elevated necks (Neave Parker’s megalosaur picture from the 1970s comes to mind), and if you look at the allosaurs that featured in Walking With Dinosaurs you’ll note that their cranio-cervical junctions are extended, not flexed as they should be. Theropod posture as reconstructed by Tarsitano (1983). Tarsitano mostly argued that non-avian theropods were more like crocodilians than birds in musculature and some aspects of posture. On to ornithischians. It was difficult to keep a tight lip back in February 2009 when the long-necked stegosaur Miragaia longicollum was published. Like the WWD diplodocoids, Miragaia was given a non-extended cervico-dorsal junction and extended cranio-cervical junction: in other words, its neck and head were illustrated projecting forwards in a straight line, as a continuation of the animal’s dorsal column (Mateus et al. 2009). Based on what we know about living animals, it’s more likely that the cervico-dorsal junction was extended, and that the cranio-cervical junction was flexed: in other words, that the neck was strongly elevated relative to the dorsal vertebrae, and that the head was held at an angle to the neck. Given the remarkable length of its neck, this at least makes it possible that Miragaia was a high-browser. I look forward to seeing artistic reconstructions that show this animal with its head held up above its back, rather than extending forwards and parallel to it (actually, I’ve already seen two, but you know what I mean). In fact, like sauropods, stegosaurs have been flat out abused by palaeontologists, with non-extended cervico-dorsal junctions and fully extended cranio-cervical junctions being the norm across more than 100 years of description and reconstruction. And don’t use the excuse that these reconstructions are all meant to show the animals engaged in feeding or foraging: they’re not. Many of them clearly depict the animals standing, in relaxed poses, and doing nothing. Marsh started it in 1891: he showed the skull of Stegosaurus armatus (then S. stenops) fully extended, rather than flexed, on the neck, and showed the neck continuing in (approximately) a straight line from the dorsals. This reconstruction was hugely influential, of course, and even today the popular conception of the stegosaur – with its horrible over-arched back and down-sloping tail – is based on Marsh’s drawing. Later stegosaur reconstructions by Lull and Gilmore perpetuated the idea of non-extended cervico-dorsal junctions and fully extended cranio-cervical junctions in Stegosaurus (see Czerkas 1987 for a review of stegosaur life reconstructions), and the same posture was later reconstructed for Huayangosaurus, Kentrosaurus, Tuojiangosaurus and others (see Galton & Upchurch 2004). Tuojiangosaurus, as displayed in the Natural History Museum, London. (c) NHM (image from wikipedia). Note the lack of extension at the cervico-dorsal junction and the slight hyper-extension at the cranio-cervical junction. Those stegosaur reconstructions you can see in some museums – some of which show the cranio-cervical junction in slight hyper-extension (look at the Tuojiangosaurus shown here) – are flat-out horrible and totally contradict the data we have from neck and head posture in extant amniotes (Taylor et al. 2009). In recent decades, reconstructions by artists like Stephan Czerkas and Greg Paul have given stegosaurs raised necks where the cervico-dorsal junction is extended in proper fashion (as per the data from living amniotes). I get the impression, however, that such reconstructions have not been taken seriously by ‘mainstream’ palaeontologists, at least some of whom still seem to think that stegosaurs walked around with their heads two inches off the ground. Similar mistakes have been made with ankylosaurs: most classic reconstructions show non-extended cervico-dorsal junctions where the neck emerges in a straight line or even slopes downwards, and cranio-cervical junctions that are in full extension. This goes for Ken Carpenter’s Euoplocephalus [shown in composite above] and Sauropelta, Richard Lull’s Nodosaurus, and others (Lull 1921, Carpenter 1982, 1984). Again, the reconstructions that show these neck and head postures do not definitely show the animals in feeding, foraging or searching postures: they are meant to depict the ‘normal’ (viz, relaxed) pose for the animal. A gently elevated neck with an extended cervico-dorsal junction and a flexed cranio-cervical junction is, again, what we should expect given what living animals do, and this has been correctly portrayed by some. Other ornithischians have generally been reconstructed accurately (at least as goes neck and head posture), but there are, however, a few ceratopsian reconstructions showing non-extended cervico-dorsal junctions and fully extended cranio-cervical junctions. Granger & Gregory (1923) reconstructed Protoceratops in this manner, for example, and ceratopsids have sometimes been shown this way too (Lull 1933). Again, the reconstructions I’m referring to are meant to show normal, relaxed poses, rather than feeding or foraging poses, so criticism is justified. Putting extension into the ceratopsian cervico-dorsal junction raises the head somewhat, such that the top of the frill is now higher than the top of the back rather than lower than it. Notably, some articulated skeletons are displayed this way: the Centrosaurus panel-mount AMNH 5351, shown here, is one of the best examples. Lull thought that the neck had been elevated too much and that the neck posture ‘is that of death rather than that of life’! Peter Galton’s Hypsilophodon (which has mostly been superseded by Greg Paul’s reconstruction these days anyway) should also be considered suspect in view of the strongly extended cranio-cervical junction (Galton 1971, 1974), but the animal was clearly meant to be running at speed, so you could argue that it was shown holding its head and neck in a decidedly un-relaxed pose. I should point out again at this point that our contention (that cervico-dorsal junctions should be shown in extension in a relaxed animal, and cranio-cervical junctions should be shown in flexion in a relaxed animal) is a hypothesis. It’s possible (unlikely perhaps, but possible) that some stegosaurs, or ankylosaurs, or therapsids, or whatever, did some funky stuff with their occipital condyles or vertebrae and evolved a relaxed head and neck posture different from that of living amniotes, and indeed (as we’ll see in a moment) there surely are at least some exceptions within Amniota. However, if you think a given animal represents a special case, you’re gonna have to demonstrate it. Shock horror, marine reptiles on SV-POW! Elsewhere among Reptilia, the data from living lizards and crocodilians indicates that, generally speaking, we should expect fossil forms to hold their necks elevated at moderate angles of between 20-40° relative to the dorsal column when in normal, relaxed pose. Many fossil, non-dinosaurian archosaurs (like rauisuchians and aetosaurs) have been reconstructed this way (mostly because people have looked at living crocodilians when reconstructing these animals), as have fossil squamates and many others. A very old reconstruction of the Jurassic plesiosaur Plesiosaurus. We do, however, have a contradiction of sorts when we come to sauropterygians (the plesiosaurs and their relatives). Reconstructions of plesiosaurs have evolved in similar fashion to those depicting sauropods: some old reconstructions (some, not all) depict them with extended cervico-dorsal junctions and flexed cranio-cervical junctions (such reconstructions typically show the animals sticking their necks well up out of the water and peering around) (e.g., Williston 1914), but many others show them with non-extended cervico-dorsal junctions and fully extended cranio-cervical junctions. In other words, with the neck and head continuing in a straight line from the dorsal column. The elasmosaurid Thalassomedon haningtoni, as displayed at the Denver Museum of Nature and Science. Check out the big neural spines. Contradicting the idea that plesiosaurs looked down on their prey from above is the fact that their orbits often face slightly or strongly upwards, and there are also indications from their narial and ear anatomy that they were specialised for detecting sensory cues in water, not in air (Cruickshank et al. 1991, Storrs & Taylor 1996). Furthermore, their high-density, often pachyostotic skeletons indicate that they were negatively buoyant animals that were trying their hardest to stay submerged and beneath the surface. All of this indicates that plesiosaurs were subaqueous predators that mostly kept their necks and heads beneath the surface of the water (except when breathing). This makes it very unlikely that their necks were elevated, and indeed – in strong contrast to sauropods and other dinosaurs – there are indications from their vertebral anatomy that neck elevation was not possible in the group (in elasmosaurs, for example, the neural spines on both the cervicals and dorsals are tall and sub-rectangular and it’s difficult to imagine how this would have allowed anything more than extremely subtle extension at the cervico-dorsal junction). So I am going to go out on a limb here (or, more accurately, I’m going to agree with everyone who works on plesiosaurs) and say that plesiosaurs did not hold their necks in the same manner as the extant amniotes that we looked at (Taylor et al. 2009). Is this because they were aquatic, and hence not under the same gravitational constraints as terrestrial amniotes? That looks likely, but we really need to thrash this out once and for all: further work on this is obviously needed, and perhaps it will appear soon. I know from many discussions that plesiosaur researchers talk as much about long necks as sauropod researchers do. Moving now well away from dinosaurs and archosaurs and even reptiles, I’ve had non-mammalian synapsids on my mind an awful lot during all of this. While many of them have relatively short necks, members of some groups have still been shown in downright unlikely postures. Dinocephalians have consistently been shown (correctly) with extended cervico-dorsal junctions and flexed cranio-cervical junctions, so those reconstructions of such things as Titanophoneus and Moschops with their necks held high and their heads at an angle are correct based on the data from living amniotes. However, some reconstructions of some caseids (Stovall’s Cotylorhynchus), dicynodonts (I’m looking at you, Watson’s rendition of Lystrosaurus [shown at top of composite image used above] and Cluver’s Cistecephalus) and gorgonopsids (Colbert’s Lycaenops, for example; shown below) have the cranio-cervical junction in extended or even hyper-extended pose, which again is a total no-no unless there is evidence to the contrary. While some of these animals have been reconstructed in walking or running poses (and hence might be holding their necks and heads in special searching or foraging poses), plenty of others are shown standing on all fours, in relaxed, ‘normal’ poses, so their unusual neck and head poses are, we can assume, meant to be the relaxed, ‘normal’ poses (further examples include King’s Dicynodon and Dinodontosaurus). The relatively short necks of these animals mean that, even with the cervico-dorsal junction in full extension, the neck is only elevated by a slight and thoroughly believable 20-40° relative to the dorsal column. Similarly, showing the cranio-cervical junction in flexion is no big deal, as all it does is rotate the skull such that its long axis is at an angle to the neck, rather than acting as a straight-line continuation of it. It seems that more extreme cervico-dorsal extension and cranio-cervical flexion evolved within Mammalia, and hence that non-mammalian synapsids were more like other ‘average’ amniotes in head and neck posture. Nevertheless – again – reconstructions that show the neck and head as straight-line extensions of the back should be considered inconsistent with what we know of neck and neck posture in living amniotes. We really hope that our paper will inspire some much-needed debate, and instigate some new work. As you’ll know if you’ve been following the comments on blogs and such, and the media coverage we’ve been getting, there’s every indication that this is exactly what will happen. But what makes this work of particular interest to people in general – and not just to specialists who spend their time worrying about cervical rib morphology and its correlation with functional morphology, or whether the bifurcate neural spines of some sauropods are homologous with the single neural spines of others, and so on – is that it has a real and obvious effect on the life appearance of a fossil animal. And, as I’ve tried to show here, our hypothesis extends beyond the limits of Sauropoda. Stegosaurs and dicynodonts need never look the same way again. Carpenter, K. 1982. Skeletal and dermal armor reconstruction of Euoplocephalus tutus (Ornithischia: Ankylosauridae) from the Late Cretaceous Oldman Formation of Alberta. Canadian Journal of Earth Sciences 19, 689-697. Carpenter, K. 1984. Skeletal reconstruction and life restoration of Sauropelta (Ankylosauria: Nodosauridae) from the Cretaceous of North America. Canadian Journal of Earth Sciences 21, 1491-1498. Cruickshank, A. R. I., Small, P. G. & Taylor, M. A. 1991. Dorsal nostrils and hydrodynamically driven underwater olfaction in plesiosaurs. Nature 352, 62-64. Galton, P. M. 1971. Hypsilophodon, the cursorial non-arboreal dinosaur. Nature 231, 159-161. Galton, P. M. 1974. The ornithischian dinosaur Hypsilophodon from the Wealden of the Isle of Wight. Bulletin of the British Museum (Natural History) 25, 1-152. Galton, P. M. & Upchurch, P. 2004. Stegosauria. In Weishampel, D. B., Dodson, P. & Osmólska, H. (eds) The Dinosauria, Second Edition. University of California Press (Berkeley), pp. 343-362. Granger, W. & Gregory, W. K. 1923. Protoceratops andrewsi, a pre-ceratopsian dinosaur from Mongolia. American Museum Novitates 72, 1-9. Lull, R. S. 1921. The Cretaceous armored dinosaur, Nodosaurus textilis Marsh. American Journal of Science 1, 97-126. Lull, R. S. 1933. A revision of the Ceratopsia or horned dinosaurs. Memoirs of the Peabody Museum of Natural History 3, 1-175. Molnar, R. E & Farlow, J. O. 1992. Carnosaur paleobiology. In Weishampel, D. B., Dodson, P. & Osmólska, H. (eds) The Dinosauria. University of California Press (Berkeley), pp. 210-224. Storrs, G. W. & Taylor, M. A. 1996. Cranial anatomy of a new plesiosaur genus from the lowermost Lias (Rhaetian/Hettangian) of Street, Somerset, England. Journal of Vertebrate Paleontology 16, 403-420. Williston, S. W. 1914. Water Reptiles of the Past and Present. University of Chicago Press, Chicago. Worthy, T. H., Holdaway, R. N. 2002. The Lost World of the Moa. Indiana University Press, Bloomington, Indiana. You mean it’s physically possible to over-arch the back of a stegosaur??? Positive supercoiling? I look forward to new reconstructions inspired by this. 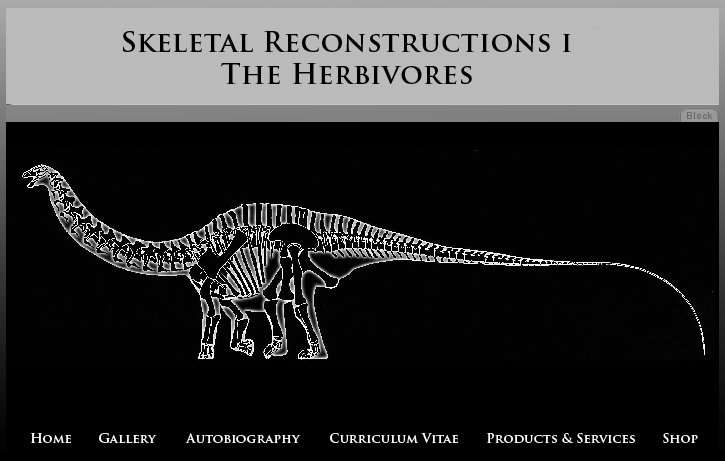 Just to be clear, are Greg Paul’s reconstructions of Apatosaurus and Triceratops at his new website ( http://gspauldino.com/skeletalreconstructions.html ) now to be considered incorrect also? I wouldn’t go so far as to call this “incorrect”, but I strongly doubt that what’s depicted here was habitual posture. We’ve talked about the low-necked pose of the NHM Diplodocus cast as being possibly one of the postures that it went through as it moved from habitual to drinking posture, and that is possible, but as I was looking at videos of drinking ostriches the other day I was forcibly struck that in making that transition they never go through a posture in which the neck is held out straight in front of them, but maintain a “U” shape in the neck, when the head descends by means of the proximal cervicals being progressively flexed while the more anterior part of the neck remains upright until just before it reaches the ground. The Greg Paul Apatosaurus might be in the process doing something similar. Greg Paul’s ceratopsians all have extended cervico-dorsal junctions and flexed cranio-cervical junctions, so he’s ok. That Triceratops is meant to be doing something: it’s walking along looking at the ground, so I think we can let him off for this. Hey, Darren — There was no sauropod vertebra picture in that post! Please fix this ASAP! So I am going to go out on a limb here (or, more accurately, I’m going to agree with everyone who works on plesiosaurs) and say that plesiosaurs did not hold their necks in the same manner as the extant amniotes that we looked at (Taylor et al. 2009). I agree with you about Stegosaurs. Always called an ungainly slow dinosaur- BUT when you look at its bones and structure I see a beautiful elegaint powerful beast. I see also that the head should be held high and not 2-inches off the ground ready to be stepped on! All the toys are based on these as well which certainly doesnt help the Stegosaurid cause. I bought a Dino Rider Kentrosaurus which is of a better design then a Dino Rider Stegosaurus. Im curious as to how an Elasmosaurus slept…any ideas? Great read. Im no Paleontologist BUT this all fascinates me. Hi, Colin, good to hear from you. There’s nothing we like more than drawing non-palaeontologists into our web, welcome aboard! Alas, I have nothing to suggest on how Elasmosaurus slept, but that’s because I don’t really understand how any marine animal sleeps. Darren is your man for that question.